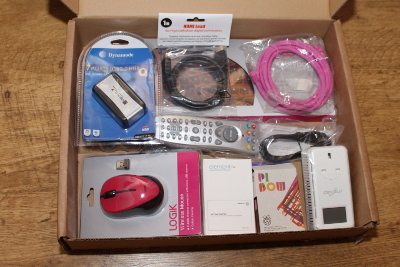 I was intending this blog post to be rather different, it was intended to show how easy you could put together your own Raspberry Pi bundle, but it didn't go quite as smoothly as planned. Fortunately it all turned out in the end, and I only had to replace one item, but it was a little frustrating for a short time. I'd decided to give my seven year old daughter a Raspberry Pi for Christmas. I'd already got a spare Raspberry Pi, but rather than use some of the existing accessories I bought most new as a Christmas present. The items came from a variety of different shops. The Raspberry Pi is an original Model B, bought when they were first available. It has 256Mb of RAM (compared to the 512Mb in the latest version) and significantly (as I will explain later) has USB fuses which have been removed from the later versions. The Raspberry Pi came from Farnell and was ordered earlier in the year, it is now available shortly after ordering, but when originally ordered took about 3 months due to the huge demand. The Pibow is a multi-coloured case, a colourful way to protect the Raspberry Pi. The Pibow can be ordered directly from Pibow, but I bought it from a Maplin store which worked out cheaper without the cost of postage. The choice of pink was in keeping with one of my daughter's favourite colours and the colour of her bedroom. I don't believe that we should paint thinks pink so that girls are interested in them the choice of colour for her room is a decision she made herself. The reason she is so interested in the Raspberry Pi is because of my enthusiasm rubbing off on her and nothing to do with the colour of the Pi, the case or any of the accessories. The bigger problem was the fact that these are wireless. 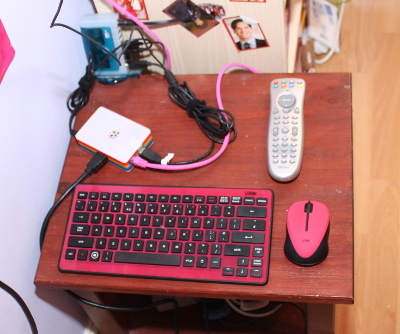 Wired keyboard and mouse would be impractical due to the position of the Pi (near the TV) compared to the desk. It also helps to keep it a bit tidier due to less cables. It does pose a few problems with power and as such a powered hub is essential (more about this later). The keyboard and mouse are made by Logik and came from Currys PC World. There are better makes of keyboards, but this one was available in the required colour at a reasonable price. It does need a separate usb dongle for both the keyboard and mouse whereas some other manufacturers (eg. Logitech) do allow you to register multiple devices to the same dongle; although the software required for Logitech keyboards appears to be Windows only - whereas at least the Logik keyboard and mouse are not dependant upon any software that is tied to a specific operating system. The one item I didn't include in the bundle is a USB power supply. I did have one in reserve, but was planning to power the Raspberry Pi from the USB hub, but this depends upon the hub used. I didn't need a USB power supply in the end, but if using one then you need one able to supply at least 700mA. The ones I have successfully used include the supply from the Amazon Kindle, a HTC Android phone, a blackberry and a USB port on a power supply surge protector. In most cases a USB to micro-USB cable is required to connect the power to the Raspberry Pi. I had purchased several from Farnell and Amazon.co.uk . I'm not sure which kind was actually given as it was in a generic bag, but any should work. The cause of most of my problems was the powered USB hub that I bought. The one I tried was bought from Farnell and whilst may be sufficient for many set-ups it was not sufficient for the wireless keyboard and mouse. Also the USB hub backfeeds power through the USB in connection. This is against the USB specifications. This is something that is unfortunately quite common with cheap poor quality hubs, but is not something I would have expected from a reputable company like Farnell. If looking for a hub I'd suggest you try and get one that has a power supply of at least 2 Amps and if you intend to power the Raspberry Pi from the hub one that can provide at least 750mA from each port. It should also not back-feed, although you are unlikely to find that included on the specs as stating that it does back-feed is more like admitting to a fault than describing a feature. The one supplier of USB hubs that does state that is will not back feed is ModMyPi.com, although I haven't tried their hub. The normal way to connect the Raspberry Pi to a network is to connect the Ethernet port to a wired router using a CAT-5e / CAT-6 cable. Alternatively if the Raspberry Pi is to be used in a different room to the main Internet connection then a wireless WiFi dongle can be used instead. In my case whilst I do use Wireless around the house due to interference the speed we get on WiFi is pretty poor and unreliable. This is particularly bad when trying to stream video between rooms. I have therefore installed Devolo DLAN Ethernet over Power into several rooms which is particularly good for using XBMC to access files on another computer. I therefore included a Devolo dLAN 200 plug-in adapter which I bought from Amazon.co.uk . If looking for networking over the power sockets then I'd recommend Devolo. It is fast and reliable and it's bundled software works well and includes a Linux client. Whilst not required for the main purpose of the Raspberry Pi a remote control can be useful if using the Raspberry Pi as a media centre using XBMC. The aim of giving a Raspberry Pi to my daughter was to teach her about how to program and to understand about computers, but I also wanted to provide her with the ability to play music and videos through her TV without needing DVDs and CDs. It may be a distraction from the main purpose this is in keeping with our digital home and in itself could be an inspiration as to what can be achieved. Most media remote controls can be used. If using one from an X-box or similar then you will need to get a separate infra-red receiver. The simplest way is to get a remote designed for a PC. In this case I bought a remote from Amazon.co.uk . My daughter has a flat screen TV with HDMI connection so I used a HDMI to HDMI cable. The one I added to the bundle was a £2 cable from B&Q, but was only 1 meter long which isn't long enough to position the Raspberry Pi where I wanted. I have used a HDMI extension cable for the moment, but will be getting a longer cable in future. When buying a HDMI cable there is no need to spend much money. Despite what some retailers may say there will be no benefits to spending a lot of money on an expensive cable. The signal is digital so there will be no loss of quality through using a cheap cable. Finally a SD card is required to store the operating system. The minimum size is 2GB, but I normally try for a 4GB or 8GB card as minimum, I also try and use a known brand as I have found them to be more reliable than some of the generic imports. In this case I used an 8GB Sandisk SD card from Amazon.co.uk . As I already mentioned I have setup the Raspberry Pi so that I can be used as an XBMC media centre as well as for programming. Whilst I initially did this on the one SD card so that it would run XBMC on top of the standard Raspbian operating system there were a few issues with the setup. To make this easier I have therefore decided to instead setup one SD card with RaspBMC as a media player and another with the standard Raspbian Linux operating system to learn programming. A guide to getting started is available from Raspberry Pi Quick start guide. The guide includes information on how to download and install the free Raspbian linu operating system. For XBMC media centre then instructions are available from Raspbmc web site. The first problem I encountered was with the Raspberry Pi rebooting during boot-up. At first look you may suspect that this is due to a problem with the operating system, but having seen others describe similar problems on the forums I suspected that this was more likely a problem with the power. In particular the reboot happened when trying to bring up the network interface which is an additional power drain in the Raspberry Pi. This was not completely unexpected as I was powering the Raspberry Pi from the USB hub. So I connected to a USB power supply and it then booted OK. This did however highlight one issue with the HUB as when disconnecting the USB supply the Raspberry Pi carried on running, but the reboot problems came back. This is due to the back feed problem and a bigger problem with this older version of the Raspberry Pi as the back feed goes through some low current fuses which overloaded. After switching to the external power supply I still found problems with the keyboard, mouse and remote control. My first suspicion was that the keyboard was not properly paired with the dongle. I therefore followed the connect instructions provided with the keyboard and mouse, but that still didn't work. I then connected them to a PC so that I could test that it was working correctly. I then identified through a process of elimination that this was a problem with the USB hub unable to provide sufficient power for both the wireless keyboard and mouse at the same time. I was able to connect just the mouse, or the keyboard and remote, but trying to connect anything else at the same time as the mouse and all of them stopped working. In the end I got everything working as planned by swapping out for a better USB hub, in this case an old one that I many years old. I already knew from experience that, that particular USB hub was capable of powering the Raspberry Pi so I used that to power the Raspberry Pi with the benefit that it just needs one supply to be switched off to power down the Raspberry Pi, the hub and accessories. The final setup is shown below. After all the issues it turned out that it was just the USB hub that was causing all the problems. Whilst this could have been overcome by powering the Raspberry Pi separately (as recommended on the Raspberry Pi website) and using a wired keyboard and mouse the solution to achieve what I wanted was to swap out the HUB. I expect others may experience a similar problem with connecting a wireless keyboard and mouse to a similar HUB. I have had many months working with Raspberry Pis and have been a technical reviewer for a book on the subject, so I had the knowledge on how to fix it. I can see this being a stumbling block to others starting out with the Raspberry Pi. This is where buying a Raspberry Pi bundle could be a good idea. Also see Suggested low-cost accessories for the Raspberry Pi.